You don’t have to like him. You don’t even have to respect him. That’s your prerogative. But there can be no denying that Floyd Mayweather Jr. is the best at what he does: Boxing and making money. From the moment he and Manny Pacquiao agreed to step into the ring and duke it out for pound-for-pound supremacy, you knew it was going to be a financial field day for the boxer commonly referred to as “Money.” But when the numbers started to roll in following his unanimous-decision victory over Pac-Man, most people needed help picking their jaws up off the floor. This fight demolished revenue records, exceeded expectations, and could possibly bring in over $600 million. Unbelievable. In all honesty, this May 2 fight was more or less a letdown. Folks who tuned in were expecting the greatest fight that $100 on pay-per-view could buy. That did not happen. In the end, the ones who prospered the most were the guys throwing the punches; especially Money Mayweather, who now finds himself as the highest-paid athlete on the planet. However, there’s a reason he was able to put himself in such a position to earn a monumental payday. He’s been a part of some excellent fights — ones that may not have earned him this sort of cash, but ones that helped shape his legacy as one of the best boxers in history. 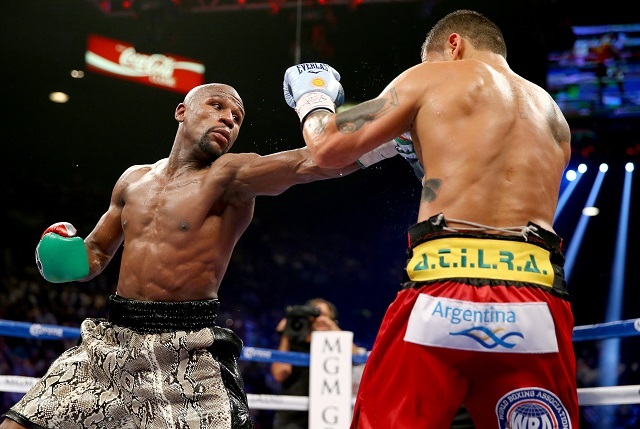 With that in mind, here’s a look at the five greatest fights in Floyd Mayweather Jr.’s career. Money Mayweather earned his first-ever world title by dismantling Genaro Hernandez in their 1998 bout at the Las Vegas Hilton. Mayweather entered the fight at 17-0, but most believed he wasn’t yet ready to face someone of Hernandez’s stature. He quickly proved those doubters wrong. Mayweather landed 54% of his punches and dominated the entirety of the fight. Hernandez was so outmatched that his corner stopped the fight after the eighth round and Mayweather would be crowned the new WBC super featherweight champion. This bout may not have lived up to it’s “fight that would save boxing ” billing, but it did bring in a massive domestic revenue stream to the tune of $136,853,700. That’s when the world of boxing realized that it could bank on Mayweather. Floyd Mayweather was guaranteed $32 million for this fight and you better believe Miguel Cotto made him work for his money. Cotto came out swinging and even managed to bloody Mayweather’s nose. Although the pound-for-pound king would come away with the unanimous decision, he did show his competitor great respect after the fight. “You’re a hell of a champion,” Mayweather told Cotto in the ring afterward. “You’re the toughest guy I ever fought.” We gave this bout bonus points on account of Mayweather’s post-fight humility. He was the best then and he’s the best now. There should be no doubt about it. The fight between Floyd Mayweather Jr. and Canelo Alvarez tops this list for a number of reasons. While we could get into the fact that this bout managed to set the all-time record for the highest-grossing pay-per-view fight ever (Mayweather vs. Pacquiao now holds the honor) or that it featured judge C.J. Ross — who scored it 114-114 — to come under even more scrutiny for her questionable decisions, we can’t get over the fact that, despite being 13 years older and weighing 15 pounds less, Mayweather simply out-classed his opponent. A performance like this one has to be recognized for what he truly was: Greatness. All statistics are courtesy of BoxRec and ESPN.go.com.